Dues for the year Sept 2016 - June 2017 are $30 per person; $40 per family. If joining half way through the year, dues are $15. June16, Friday, Picnic and Dye Day for your warps. Vilija’s home, 11 am on. The rack holds 48 cones and each side is 43.5” wide by 45” high by 5” deep. For sale $50.00 OBO. 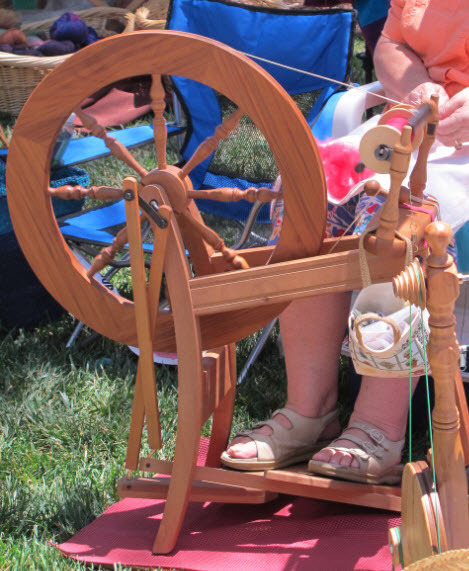 The 20th annual Spinning at the Winery, put on by the Treadles to Threads Spinners Guild, will take place June 3rd from 10 AM to 4 PM. $5 per person event fee. Due to the popularity of this event we are open for wine and glass sales only. No tastings. There will be a raffle and products for purchase! This is a great annual event and a wonderful opportunity to see word class spinners and weavers in action. Newcomers and inquiring folks are welcome. Aiko is one of many artists exhibiting at at Uptown Artists, East Bay Open Studios, which will be having their last open house in June. kitchen towels—handwoven of 100% cotton or wool on backstrap or pedal loom.